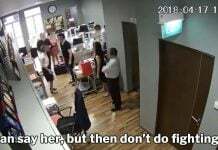 The screenshot of a Ms Danielle Goh ratting out a Singapore Armed Forces (SAF) regular for driving her on a GrabHitch ride has been making waves around the internet. Titled ‘Moonlighting’, the image shows an SAF case study of the incident which took place on 15 Dec 2016. Ms Goh was ferried from 5 Simon Road to her destination at Blk 405A, Fernvale Lane, by an army regular who was wearing his SAF uniform. 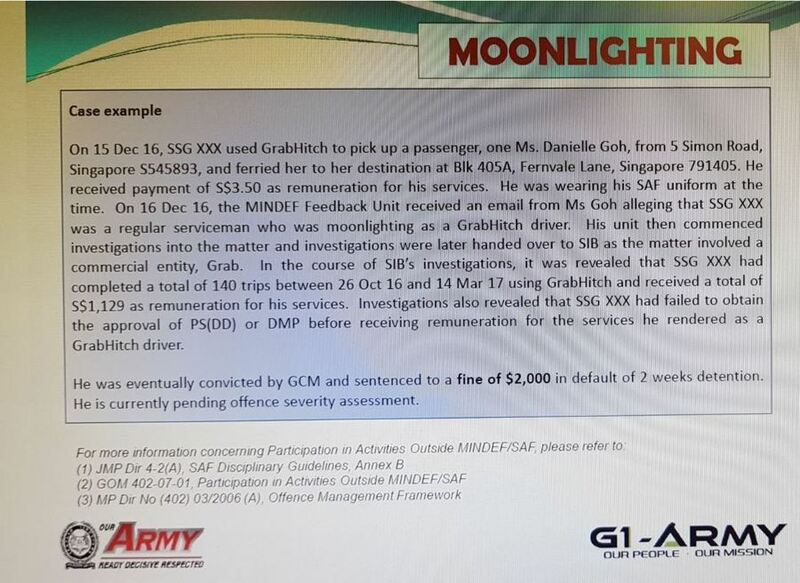 The article states that Ms Goh reported the Staff Sergeant (SSG) to the Ministry of Defence (MINDEF) Feedback Unit on 16 Dec 2016 for moonlighting as a GrabHitch driver. Following Ms Goh’s report, the Special Investigations Branch (SIB) were called in to handle investigations, given that the matter involved 3rd party commercial entity, Grab. 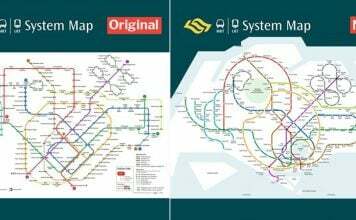 Investigations revealed that the SSG had earned a total of S$1,129 from a total of 140 trips over a period of 5 months. 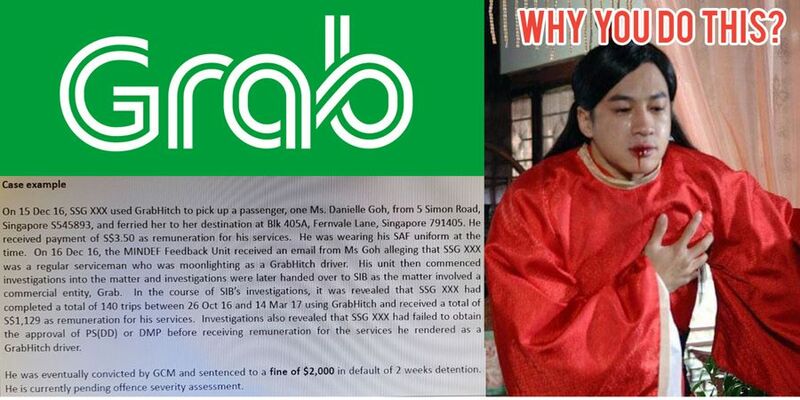 He was slapped with a $2000 fine, instead of a possible 2 weeks of detention for failure to obtain approval before earning income as a GrabHitch driver. 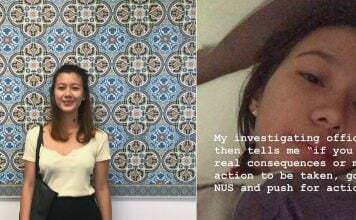 Singaporeans were appalled at Ms Goh’s reaction and criticized her for taking the GrabHitch ride, only to report her driver after alighting at her location. To make matters worse, it was revealed that her GrabHitch ride cost a mere $3.50. 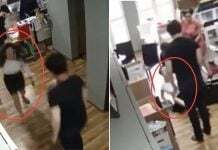 Of course, netizens had lots to say about this. Some felt that it was okay to take on a second job but argued that clearance from the main employer was needed. Others did not feel that GrabHitch constitutes as a secondary job. The validity of the story was also questioned, given that the screenshot did show that it was a “Case example”. And this person was just brutally savage. 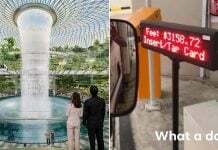 What’s wrong with driving GrabHitch? While taking a job on the side on top of a full-time job is frowned upon by most companies, what is wrong with driving GrabHitch? Unlike other Grab services, GrabHitch is essentially a carpooling service. It matches passengers with a driver who is heading to a similar destination for a nominal fee. It is understandable if a company clamps down on moonlighting because it compromises the productivity of workers. However, in the SSG’s case this seems unlikely. Also, given that he made 140 trips in 5 months, the SSG averages about 1 trip a day. Now if we assume that trip was to send a passenger whilst on the way to or back from work, actual productivity at work probably wouldn’t be compromised by much. In fact, it is environmentally and cost-efficient, seeing that it saves petrol and reduces the number of cars on roads. In the SSG’s case, he was charged for failing to obtain approval for driving GrabHitch. However this seems to be particularly harsh for earning a small fee for the troubles taken to send a passenger to a nearby destination. 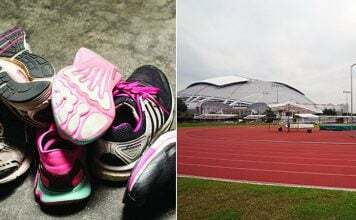 According to Asia Law Network, Mr Lau Kah Hee, a partner at Derrick Wong & Lim BC LLP, and Ms Kang Yixian, a partner at Donaldson and Burkinshaw LLP, shared their thoughts on declaring moonlighting activities. 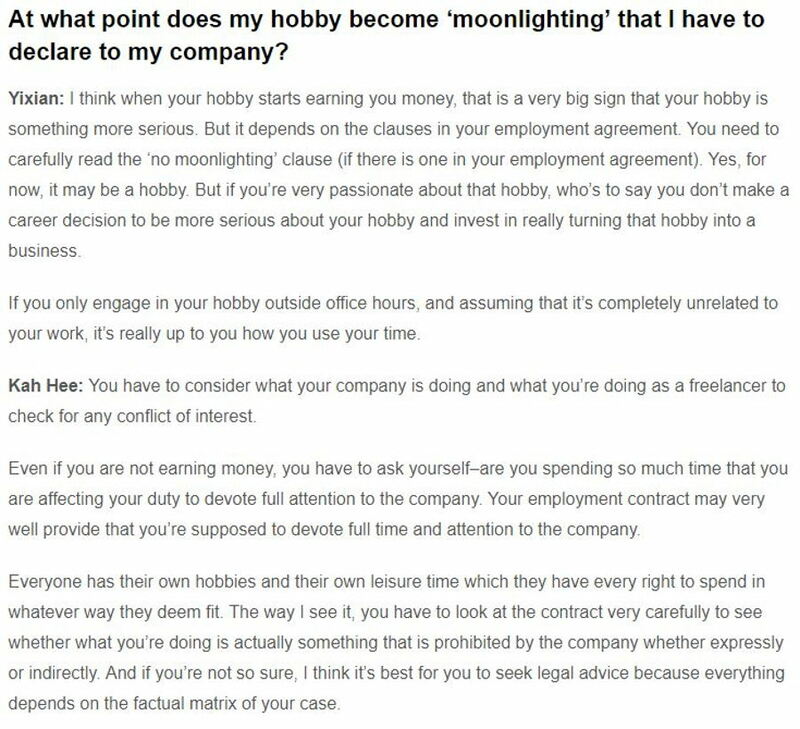 While the lawyers did not advocate moonlighting, they argued that whatever activities engaged outside office hours is free play “assuming that it’s completely unrelated to your work”. 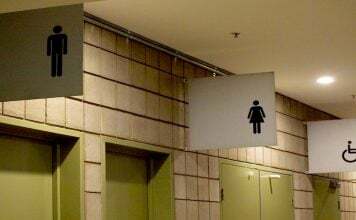 However, they advise readers to check their employment contract carefully to see if there are any clauses which stipulates a ban on secondary jobs. To be on the safe side, it would be in the interest of GrabHitch drivers to clear with their main companies first. Or, maybe MINDEF just seriously frowns upon the practice of moonlighting. And also, if you’re gonna do potentially risky things, maybe don’t wear your SAF uniform while doing it. Featured images Facebook, Hardwarezone and Twitter. Next articleTan Cheng Bock Loses Elected Presidency Appeal, Will He Finally Give Up? Trained in the dark arts as a keyboard warrior. The author is a firm believer that the pen is mighty.